The Phantoms kept their fleeting playoff hopes alive last night with a 4-2 win over the Penguins, powered by…. Oh, it was an update from the app: Cole Bardreau just scored another short-handed goal! 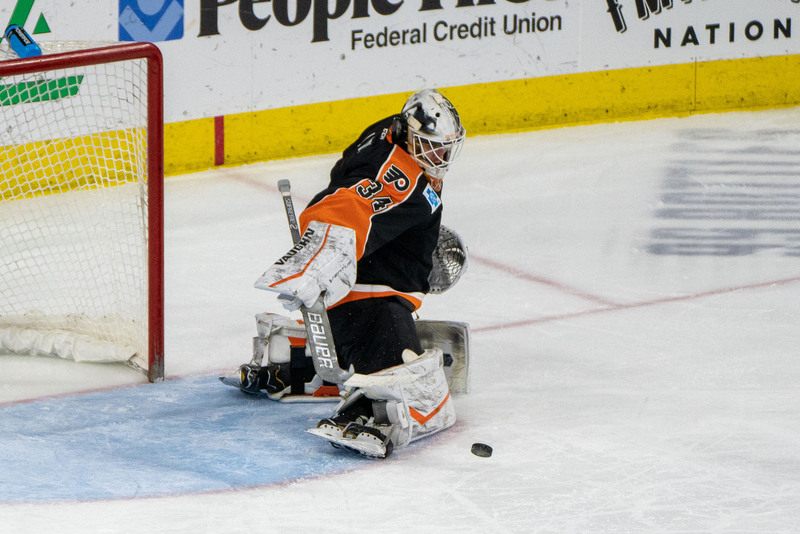 Cheer for the Phantoms today, and watch the scoreboard as Providence hosts Utica at the same time–we need a Utica win as well as our own in order to stay relevant going forward into Tuesday at Hershey. Prior to the game yesterday, we learned that F Mike Vecchione and D David Schlemko are injured, and out for the year. F Misha Vorobyev also missed yesterdays game as injured, but was not given that designation. D Phil Myers did make it back and play in the game. Read yesterdays preview for more on guests and ATOs. Reading was eliminated from the playoffs. They came from behind to win their final game last night in part because of two Steven Swavely goals, beating Adirondack 5-3. However, they were eliminated from the playoffs due to a Brampton win. The IronPigs won both ends of their doubleheader last night just across the bridge from the hockey arena, 12-3 and 4-1 over Rochester. Indeed it was a good night for Lehigh Valley professional sports! Today is a rematch of the game from last night. Look for the Penguins to come out with more determination as they also are fighting for their playoff lives. There’s a growth-chart giveaway for the kiddos. Lineup: I know it’s a day game following a night game, but desperate times call for desperate measures–I’d trot out the same group exactly, Lyon included, and tell them to do it again. You can bet Jarry will be in net again for the Pens. Additions: Reading and Philadelphia have completed their seasons. There is the possibility that players could be added for today’s game. In that case, perhaps a Corban Knight or a Justin Bailey or a Steven Swavely might be a good idea, after all. Attendance: I don’t have any money on the numbers this year, and we all know there’s fiction baked in anyway, but not for nothing: 7,715 at baseball last night; 8,435 at hockey. So take a peek at the attendance numbers just for fun, anyway. And that’s a LOT of locals out enjoying professional sports on a Saturday night! The Phantoms are in Hershey for a mid-week tilt on Tuesday. Stay tuned for the relevance of that game. As I wrote yesterday, if it all comes to an end, at least we were playing meaningful hockey into April. That’s what you’re looking for at the beginning of the season. I know that leaves my standards pretty low considering the number of teams that make the playoffs, but with the way the winds can change and impact your minor league squad, and the ubiquitous impact of the Flyers various problems, I feel like it’s justified. The Hamilton Street Heroes also have a game on the road in Providence on Friday. It would be great if that game meant something. We’ll close out the (regular) season at home next Saturday with Hartford.